The blue-winged pitta (Pitta moluccensis) belongs to the family of pittas, the Pittidae. 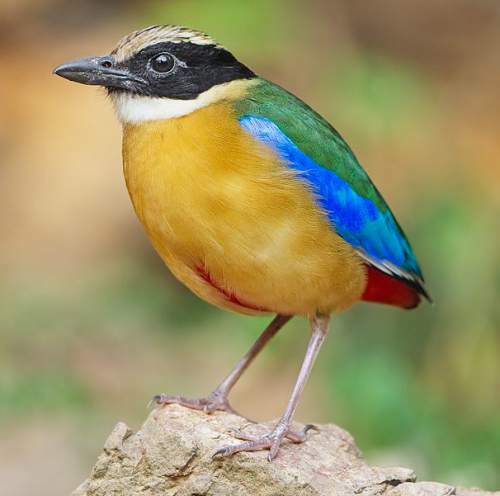 The blue-winged pitta species is distributed in India, Myanmar, Thailand, Cambodia, Laos, Vietnam, China, Malaysia, Singapore, Indonesia, Brunei and Philippines. These pitta species are mostly migratory. These pittas are monotypic species. The blue-winged pitta (P. moluccensis) is a medium-sized pitta, measuring 17 to 20 cm in length and weighing about 50 to 150 gram. These blue-winged pittas have dark green upperparts. The head is blackish in adult birds. There are buffy-brown lateral coronal bands. There is a black medial crown stripe. The chin is characteristically black. There is a whitish neck band. The rump is turquoise and the tail is black. The underparts are buff. The wings are bright and bluish. The tail is very short. The vent region and undertail are red. There is a central vertical red streak in the lower belly. Juveniles have similarly patterned plumage but are duller. The bill of the blue-winged pitta is black. The irises are dark brown. There is thin gray eye-ring. The legs are pale pink. Their call is a sharp, loud "taew-laew..taew-laew..taelaew-taelaew" sound. 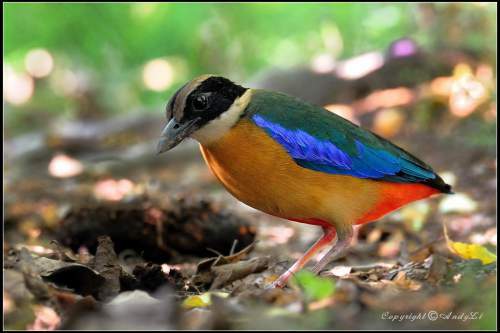 The blue-winged pitta species is distributed in India (Narcondam Island), Myanmar, Thailand, Cambodia, Laos, Vietnam, China, Malaysia, Singapore, Indonesia, Brunei and Philippines. Breeding populations of the blue-winged pitta are distributed in Myanmar, Thailand, Cambodia, Laos, Vietnam and China. Non-breeding populations occur in Malaysia, Brunei, Indonesia and Philippines. Vagrant blue-winged pittas have been observed in Australia, Christmas Island (Australia) and Hong Kong (China). In Narcondam Island, India, these birds have been observed by Manchi, S. S et al. Multiple sightings of this species signify that they might not be vagrants to this island and probably breeding visitors. The Important Bird and Biodiversity Areas (IBA) of these blue-winged pitta species in Cambodia are Ang Tropeang Thmor, Phnom Bokor and Upper Srepok Catchment. The IBA of these species in Laos are Attapu Plain, Xe Kong Plains, Dong Khanthung, Xe Khampho, Phou Dendin, Upper Xe Kaman and Siphandon. These blue-winged pitta species have moderate forest dependence. They normally occur in altitudes from 0 to 1800 meters. The artificial ecosystems and habitats of these species include, plantations, urban areas and rural gardens. 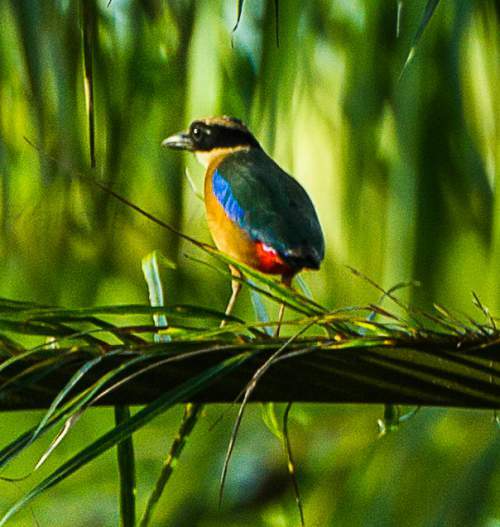 The natural ecosystems and habitats of these blue-winged pitta species include, tropical and subtropical moist lowland forests, mangroves, tropical and subtropical dry forests, broadleaved forests and moist shrublands. The diet of this blue-winged pitta consists mainly of insects and worms. Insects, insect larvae, grasshoppers, locust, cicadas, crickets, beetles, ants, termites and snails are their primary food. These birds forage on the ground and also from a low branch or perch. The breeding season of these blue-winged pitta species is from April to August in most of their range. These birds are monogamous and territorial. They nest on the ground. The nest is a large spherical and untidy structure, built with twigs, roots, grasses, leaves and mosses. The entrance is often found between tree roots near water. The blue-winged pitta clutch contains 4-6 cream-colored eggs with purple blotches. Both parents take turns to incubate the eggs. The chicks hatch out after 15-17 days of incubation. These blue-winged pitta species are mostly migrant birds. The breeding populations are found in Myanmar, Thailand, Cambodia, Laos, Vietnam and China. They move southwards in winter. Non-breeding blue-winged pitta populations are found in Malaysia, Singapore, Brunei, Indonesia and Philippines. They move northwards for breeding in summer. The global population size of the blue-winged pitta (P. moluccensis) has not been quantified. The overall population trend of the species is considered to be declining. In most of its range, this species is reported to be fairly common. The generation length is 4.2 years. Its distribution size is about 1,790,000 sq.km. Habitat alteration and destruction, fragmentation of the habitats and trapping for pet-trade are the main threats that are endangering the survival of these pitta species. The blue-winged pitta (P. moluccensis) does not approached the thresholds for being Vulnerable either under the range size criterion, or under the population trend criterion, or under the population size criterion. The CITES (Convention on International Trade in Endangered Species of Wild Fauna and Flora) status is ‘Not Evaluated’ for blue-winged pitta (P. moluccensis). The blue-winged pitta (P. moluccensis) is closely related to P. brachyura, P. nympha and P. megarhyncha. Earlier it was considered conspecific with P. megarhyncha or P. elegans. Current topic in Birds of India: Blue-winged pitta - P. moluccensis.